Marilyn Kaye (Hull) Carroll, age 71, of West Finley, PA, passed away on Friday, November 30, 2018 in Waynesburg Health & Rehabilitation Center, Waynesburg, PA.
Born December 14, 1946 in Washington, PA, she was the daughter of the late Lloyd Elbin and Ruth Evan (Murray) Hull. Marilyn was a housekeeper for nearby doctors’ offices. She enjoyed reading books, watching T.V. (mainly cooking shows and soap operas) and spending time with her grandchildren. 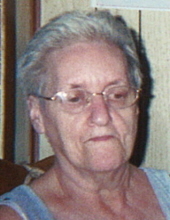 She is survived by four children, Leighann (Kenneth) Richmond, of Cameron, WV, James (Teresa) Carroll, of Wind Ridge, PA, Brad (Terri Hice) Carroll, of Graysville, PA, and Brent Carroll, of Wind Ridge, PA; seven grandchildren, Chad, Crystal, Carrie, Jesse, Bailey, Brilee and Bexley; five great-grandchildren, Abigail, Eli, Alayna, Maverick and Watson; three brothers, Melvin Hull, of Waynesburg, PA, Kenneth (Barbara) Hull, of Moundsville, WV, and Terry (Kaye) Hull, of Waynesburg, PA. In addition to her parents, she was preceded in death by her husband, Harry Carroll, who passed away September 30, 2016; four brothers, Roger, Lloyd Eugene, Oscar L. and William Hull; three sisters, Mary Wise, Nadine Stewart and E. Joan Hughes. At the request of the family, all services are private. She will be laid to rest in the West Finley Cemetery, West Finley, PA. Arrangements were entrusted to Kesterson-Rush Funeral Home, LLC., 3275 W. Roy Furman Hwy., Rogersville, PA, 15359. To send flowers or a remembrance gift to the family of Marilyn Kaye (Hull) Carroll, please visit our Tribute Store. "Email Address" would like to share the life celebration of Marilyn Kaye (Hull) Carroll. Click on the "link" to go to share a favorite memory or leave a condolence message for the family.